You get the sense that the band is more than aware of their rather fortunate place in the pop universe, because they just used that freedom to create their most adventurous, and consistent, album to date. Of the Blue Colour of the Sky bears little resemblance to the over-caffeinated power pop that once served as the band’s calling card, trading the muscular grooves of their 2005 album Oh No for something, well, groovier. Prince’s influence is all over the place, from the Parade-ish “WTF?” (complete with a 5/4 time signature and rip-roaring solo) to the slammin’ “White Knuckles,” which is one of the best “1999” covers ever. (Likewise “End Love,” which is this album’s “I Would Die 4 U.”) Singer Damian Kulash gives the falsetto an extensive workout here, which is fitting with the lyrical content; he’s clearly had his heart broken – “Needing/Getting” is the Jilted Lover song of the year – so the falsetto gives good voice to his pain. 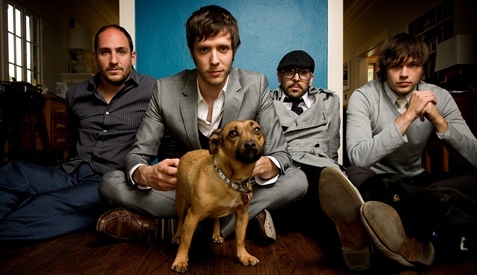 If they’re smart, OK Go will consider adding producer Dave Fridmann as an unofficial fifth member, because his influence here cannot be underestimated. The drum tracks sound like the stuff of Steve Lillywhite’s wet dreams circa 1983, and the guitars are crystal-clear. He clearly encouraged the band to think big, because these songs bob and weave in ways the band had never dared to try before; “Needing/Getting” and “Skyscraper” both feature lengthy outros, and the overall sound is positively massive compared to the stripped down Oh No. If there’s a catch, it’s the album’s final third; there is nothing particularly wrong with the songs, but emotional fatigue begins to creep in. And then, in the final moments of closing track “In the Glass,” they clean the slate with one hellacious tribute to “I Want You/She’s So Heavy,” a slow-building, climbing/falling chord sequence that will give Chris and Ben from Death Cab fits. If only Fridmann hadn’t recorded the drums so hot at the end; the music is so pretty, but when turned above a whisper, the drums sound like an avalanche. Pity, since Fridmann had done such a good job avoiding that pitfall up until then.